I am kicking off my three-day holiday weekend after work with my friend, Albee. When I last saw him in December, we dined at a Spanish restaurant in Greenwich Village called Café Espanol. The fare is simple, home-style grub. We decided to pass on ordering the house red and popped an extra seven bucks for a Tempranillo that the waiter suggested. 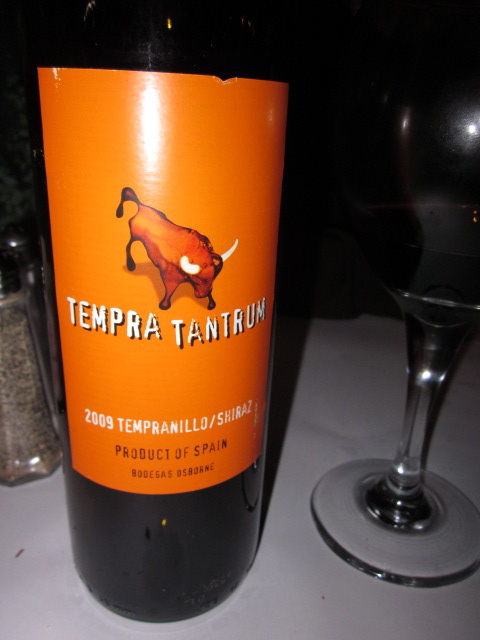 We also liked the wine’s name and label – Tempra Tantrum. After we paid, the waiter returned with our change which included a Where’s George? dollar bill. 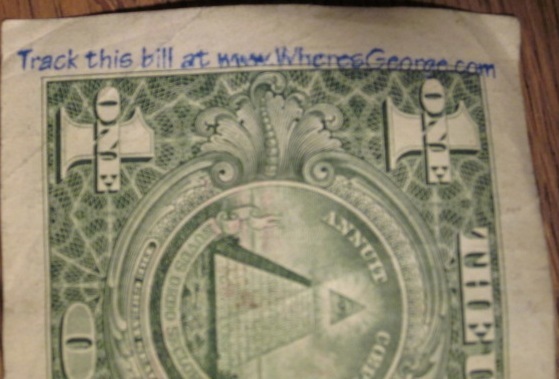 Dollar bill with Where's George? stamps. For those unfamiliar with Where’s George?, it’s a geek web site that tracks currency. The site has been investigated by the US Secret Service because they used to sell rubber stamps and it’s illegal to deface currency. The Secret Service informed Hank Eskin, who started the site in 1998, that the stamps are considered advertising. That motivated him to stop selling them, the Secret Service got off his back, and the site continues. A not too big big deal to the Secret Service. Foreplay Pauser: Hey, what do you say, let’s climb off each other and track all the cash in our wallets now? Me: If we don’t track it, you’re not going to inherit it! Elsbeth: What day is it? Elsbeth: I meant to look at my calendar, but I forgot. Me: That’s why you have me. [pause] What were we talking about, Boss? Me: Huh. Will my bill top that? Off to a snail slow start. My Where’s George? 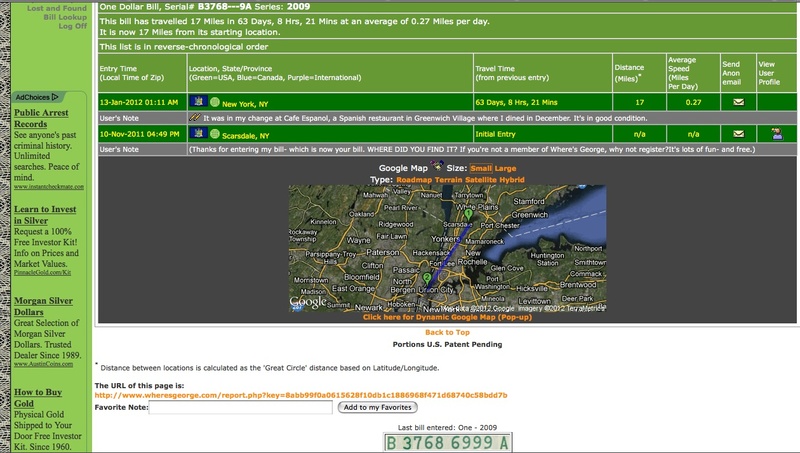 bill was entered in Scarsdale, New York in November 2011. Thus far, it’s traveled 17 miles to reach me. Clearly, this Lame Adventures single has exited the starting gate at a crawl. This entry was posted in Humor, new york city and tagged cash, currency, geek, hank eskin, hobby, procrastination, us secret service, where's george. Bookmark the permalink. I have the urge to grab that dollar and throw it into one of the bodies of water that surround our island. You’ve motivated me to spend it fast to save it from drowning! Yeah, that’s some fast cash alright! Who knew there was such a website. You have a way with money, don’t you? That dollar actually bounced back to my bud, Albee, last night when we were snacking on cupcakes. I paid for mine first using that dollar (and two and a half more — this is NYC). He paid for his second and got that Where’s George? dollar back in his change. We might be bouncing that single off each other all year like a good Roger Federer / Rafael Nadal rally.